To remember and honor the Skill, Greatness, and Wisdom of the late GM Kang Sin Sin (江新辰), the disciples Michael, Rio, and Febry decided to publish this website as we need to preserve the Wing Chun KungFu of the late GM Kang Sin Sin by spreading his way of teaching and the style that he learnt from the late GGM Ip Man (Yip Man), the late GM Leung Sheung, and the late GM Chu Shong Tin. This is a short memoir written by one of the late GM Kang Sin Sin's disciple, Endra Prajitno (aka. Wei Wei). 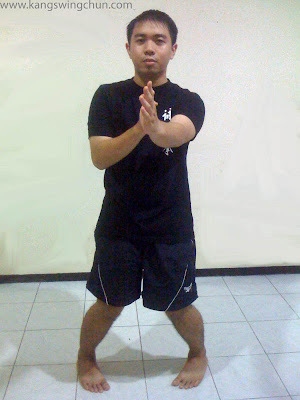 especially for Wing Chun kung fu. He is a student of GM. Chu Shong Tin and GGM. Yip Man. He was very talented to learn all styles of kung fu, but he was very interested in exploring and teaching Wing Chun. When I learned Wing Chun from him, I felt very lucky because he was from the Yip Man lineage. And the teaching methods that taught by him was very reasonable and innovative. He had good command of the entire movement of Wing Chun, and he was very much understanding about the intentions in Wing Chun movements. All the movements that he taught showed that he deserved to be the Grand Master of Wing Chun kung fu. He taught with patience, and even though he was old, his whole movement was very fast and looked very good. And from the life he had gone through, he gave the “gold” to all students who have been taught by him. That’s true story about Grand Master Kang Sin Sin, who has brought the true name of Wing Chun in Indonesia.